A saddle should be set at least two fingers behind the shoulderblade, to allow the shoulderblade freedom to rotate. Unfortunately, sometimes the flap will interfere with the rotation of the shoulderblade, even when the saddle is set back. When the horse is standing, the shoulderblade is in "neutral." It is neither forward nor back. This horse has a rather upright shoulder; the neutral position of the shoulderblade may be a little more sloped in many horses. As a horse strides, his shoulderblade rotates backward, under the saddle. 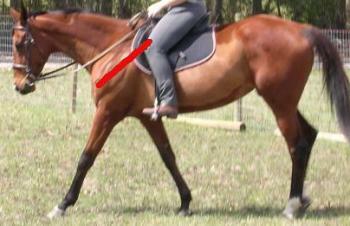 The movement of the shoulderblade takes it fairly deep under the saddle. 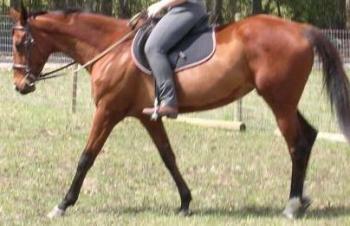 If the saddle fits the horse well, then it will allow the shoulder to rotate under the saddle with no interference. Again, this horse has a fairly upright shoulder. In a horse with more slope to the shoulderblade, the rotation will be even further under the saddle flap. However, if the saddle is too tight, or the flap points inwards, or the flap is held down too tightly by the billets, then the shoulderblade will not be able to rotate smoothly. Instead, the tip of the shoulderblade "bumps" into the front of the flap. The thin skin above the shoulderblade gets "pinched" between the tip of the shoulderblade and the saddle flap. This will be painful. The skin will be tender; imagine giving yourself a big pinch along the ribcage...now take a walk, and pinch with every step you take. The horse will be less likely to extend his leg very far forward, because each time he does, he gets pinched. If the flesh in that area becomes tender enough, it will even be painful after the saddle is removed from his back. The shoulderblade may not be bumping into the saddle flap anymore, but now the shoulderblade is rotating under a muscle that is very tender. Each time the horse extends his leg, there is a small trauma to that area of skin. Over time, that area will begin to form a callous, a layer of scar tissue. The most trauma is to the skin closer to the shoulderblade; the scar tissue will not form on the outside, but between layers of skin, under the surface. Because the tissue is under the surface, that scar tissue may even feel like a muscle. It is thick and firm, and there is skin over it which is a little looser. However, it's not firmly attached to any bone, and it's not below a layer of taut skin, so you can pull on it, knead it, etc. It will slide around a bit more than a muscle should, however. 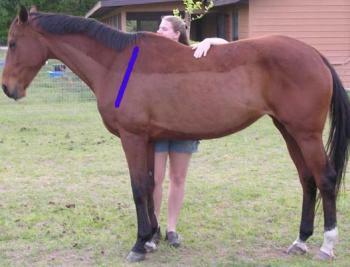 Compare the freedom of movement of that tissue with the muscles at the top of the hindquarters. They may also be thick and firm, but they are taut: they do not allow much movement. Because the scapula rotates as it goes back, there are several places where it may interfere with the flap. If the saddle is much too far forward, then scar tissue may form just behind the scapula, at the top (yellow). 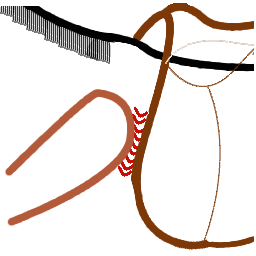 If the saddle is properly placed, but the flap is still interfering with the shoulderblade, then the tissue may form lower and farther back (pink). If the horse begins to form such scar tissue, then it's possible that the shape of the saddle just does not match his back well. A forward-flap jumping saddle may be too much for some horses; in such cases, the horse could do better with a more straight-cut saddle (dressage, VSD). Limited use of a jumping saddle, on these horses, can minimize more scar tissue--just when competing, or schooling over higher jumps, for example. The saddle may also be too narrow. A more narrow saddle will hold the saddle flaps more tightly to the body; because the points are not spread as wide as they could be, they press the flaps into the body of the horse. Even a few inches down from the tip of the points, the saddle flap may be digging a bit into the horse's body. A point billet also will likely cause this kind of scar tissue formation. The point billet comes straight down from the point of the saddle, along the front of the flap. 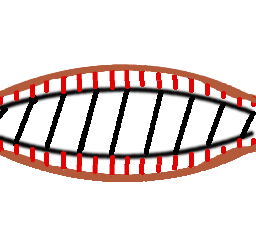 When the billet is buckled to the girth, it presses the front of the flap into the horse's body. The point billet does not allow the shoulderblade to rotate back without "bumping" into the flap. Don't put your saddle farther back! If it is already about 2 fingers behind the shoulderblade, then the placement is correct. If the saddle is correctly placed, but the flap is still interfering with the horse, then you should instead look into the fit of the saddle. It may be that the saddle simply does not work with that horse. If it is narrow, if it has point billets, if the flaps are very forward, then you may simply need a different saddle for regular schooling. It may be that something can be done to make your saddle more comfortable for the horse; a visit from a professional saddle fitter is a lot cheaper than a new saddle--especially as you can't be sure that the new one would fit, either. A saddle fitter can advise you about your current saddle, or help you find a new one. What if your horse already has a lot of scar tissue? Unfortunately, thickness at that spot will make the shoulderblade *more likely* to interfere with the flap. The scar tissue is between the flap and the shoulderblade; effectively, the space between the horse's body and the flap is smaller. The flap must be able to sit that much further away from the horse. There is something that can be done about scar tissue. An equine massage therapist can work the tissue, help to reduce it, and loosen the thick compact tissue. Also, when a horse is experiencing pain, he often tenses or moves in an unusual way to avoid the pain. An equine massage therapist may be able to locate areas which are holding tension, or which have been made tight by the unusual movement.